I brought two wedding books to the store yesterday to add to our growing library. (Yes, My Little Flower Shop, top Palm Springs florist, is building a wedding book library)! Looking at books with our brides gives us a chance to prepare them for the inevitable moment of panic in the ‘Weddings” section at Barnes and Noble. If you know what to expect, you won’t be discouraged by these experiences of book-overload. So, knowing that the mountain of information you’ll face, keep these tips in mind. 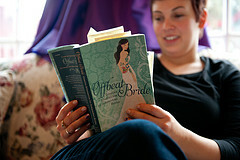 Wedding planning books are not required reading, and 99.9% of what’s in them probably doesn’t apply to you. (Are you inviting Norwegian royalty to your wedding? Didn’t think so). Once you’ve got the books, (and this is the important part,) they do not need to be followed obsessively to the letter. They are not written in stone. They were not given to us at Mount Sinai. Books should be considered guidance, opinion and advice. From someone who doesn’t care if you ignore them. How about looking in the library? If you find one you love, buy it. If not you’re not out $35.00 for a book you don’t need. Bottom line? Talk to the vendors you’re working with! Their advice is the most valuable of all. In terms of how they do weddings, and work with their clients, well, they wrote the book. If Music Be The Food of Love, Play Some Once In A While!